BOTANY BUILDINGS Grow Buildings From Trees! We’ve seen trees molded to form fantastic living chairs before, and now a young group of German architects are bending trees to their will to form a new breed of living architecture. The team is calling their tree-shaping system “Botany Building,” and while it may not be the cure to climate change, it’s an incredibly interesting way to create living structures. Situated at the University of Stuttgart‘s Institute of Basics in Modern Architectural Design, Oliver Storz, Ferdinand Ludwig and Hannes Schwertfeger build their organic structures from quick-growing trees like willows, which can be shaped to grow a certain way and provide support or protection. The team is also researching the elasticity of trees and how effectively trees can grow around steel support systems, and they hopes to grow structures for all types of purposes – walkways, towers, bird watching stations, and pavilions. They have already finished several projects including a bird watching station in the Bavarian Forest, a willow and metal walkway on Lake Constance and soon a “Green Room,” in downtown Stuttgart, which will be an outdoor pavilion for exhibitions and concerts. Bending trees to your will into living structures isn’t as easy as one might think. There is a lot of grafting involved, as well as the construction of support structures, maintenance, and care. First the support structure is built, which the trees will grow around and up. Then young, flexible trees are planted, attached the structure, and carefully bent into the the starting position. 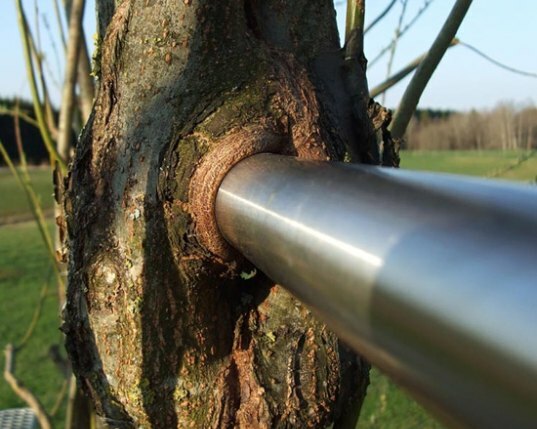 As the trees grown they are continually monitored and checked to avoid being stunted by the metal clasps, which can restrict the flow of sap. Once the trees are finally grown and have taken on a load-bearing function, a structural engineer tests them for stability and strength – a “botanical certificate of fitness,” if you will. At that time the support structure can be removed. The tree tops are really the limit for this type of architecture, so don’t expect trees to perform as well as traditional building materials like concrete or steel. There is a limit to what trees are capable of, and the architects have to work within the boundaries of the tree’s growth and ability. You never cease to amaze me with these amazing pictures! I suppose this is the ultimate tree house! We've seen trees molded to form fantastic living chairs before, and now a young group of German architects are bending trees to their will to form a new breed of living architecture. The team is calling their tree-shaping system "Botany Building," and while it may not be the cure to climate change, it's an incredibly interesting way to create living structures.